The appearance of the nails can be an indication of an underlying medical conditions in your body. Their appearance can mean different things. For example, thyroid problems can produce symptoms such as brittle nails. Vitamin deficiency can also lead to thin or weak nails. When they turn yellow or black, toenails can point to a fungal infection that needs treatment. Such nails are commonly linked with the condition called Onychoschizia. More on this, causes and pictures below. But first, what is characterized as brittle toenails? What do they look like and what should you do? The term is used to describe nails that split and break easily. They may be thin, hard or soft, but most importantly they split and break quickly. In most cases, they are a sign of the normal aging process. There are other factors that can be linked to this problem. The brittle toenails cause a lot of misery and they often lead to split ends. Further, they are a source of shame because you will not be comfortable putting on sandals. 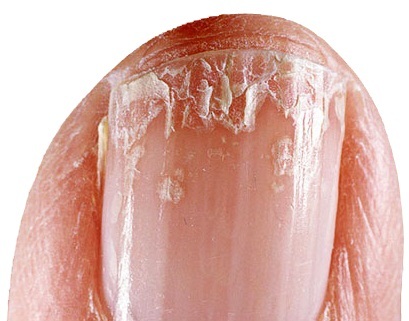 The occurrence of brittle nails has also been linked to constant exposure to moisture. It is also likely that it is increased by the inset of low atmospheric humidity. You can however treat this condition with a lot of ease by soaking or applying some lotion. If your nails dry, they become more vulnerable to breaking as well as infections. When they dry, they are deprived of moisture and sebum whose role is nourish the roots. This occurrence is very common in the aging process. Further, you will suffer this if you submerge your hands in water for a long period of time. Harsh chemicals exposure is also likely to make your hands to dry out. The chemicals include detergents, soap as well as overuse of nail polish remover. Your body should get access to adequate nutrients so as to function normally. Lack of adequate supply of these nutrients will make your body to respond in various ways. Most importantly, vitamin deficiency is linked to various conditions of the nails. The supply of the vitamin C, biotin and pantothenic acid should be constant so as to assure the robustness of your nails. Failure of this supply leads to the nails being weak and then break off. When your thyroid gland underperforms, you are likely to have brittle toenails as one of the symptoms. It comes with other signs and symptoms like weight gain and fatigue. The polishes that are used in the process suffocate your toenails. Once your nails are not given a chance to breather, they are easily attacked by fungal infection which then spread over. There are several other chemicals that are used in the process. These chemicals found in the polishes end up softening your nails. In the long run, they end up being susceptible to infections like the fungal infections. There are chances that the tool used may not be sterilized properly. This facilitates the spread of the infection from one area to another. There are various conditions on your skin that can cause brittle toenails. They end up making your toenails to have yellow cuticles and crumble. For instance, psoriasis and eczema have been linked to this. They make your nails weak and this makes the formation of ridges a possibility. You need to have a balance between excess and lesser moisture. Too much moisture makes your nails to be very weak. The moisture can be trapped below the nails and this causes the fungal attack very likely. In the event that your toenails are dehydrated because of chemicals, they become very brittle. There has been an observation that particular careers have a direct link to the brittle nails. For instance, the salons and industries. There exists a link between conditions like diabetes and brittle toenails. The commonest one is the type 2 diabetes. In diabetes, you will experience poor circulation of blood and damage to the nerves. Your toenails then harden and become dark. Loaded with nutrients, Apple cider vinegar is very instrumental in treatment of brittle nails. The nutrients include; potassium, magnesium, iron, calcium, and other vitamins. Acetic acid and malic acid in apple cider vinegar heal you of any nail infections. Make a mixture of water and apple cider vinegar (unfiltered and raw) in equal amounts. Put your nails into this solution allowing them to soak. After a few minutes, remove the cuticles from your nails. You are required to do this on a daily basis. Do this at least once in a day and in a few days, your nails will be very strong and healthy. Beer contains potassium, biotin, selenium, and phosphorus. All of these are why beer keeps the brittle nails strong and healthy. Heat a quarter cup of olive oil. Add ¼ cup of apple cider vinegar then add ½ cup of beer. For about ten minutes, keep your legs soaked in the solution. Receive this procedure two times a week. You will enjoy the advantage of healing minerals in sea salt when you use it to treat brittle nails. Sea salt softens your cuticles and leaves your nails with a very brilliant appearance. In a small bowl of warm water, add 2 tablespoons of sea salt which has fine grains. If you are in access of myrrh, frankincense, wheat germ oil, and lemon juice, add them to your sea salt water mixture. For about fifteen minutes, soak your nails into this mixture. Using warm water, rinse your toe nail and pat them dry. You are required to follow this procedure at least three times in a week. Coconut oil nourishes brittle nails. Coconut oil contains saturated fats and it is these fats that moisturize your toe nails. Generally, this oil prevents any form of nail infections. Warm some coconut oil and apply it gently on your toe nails. Massage the oil very well on your nails for about five minutes. You are required to do these three times in a day. Lack of moisture is one of the causes of brittle nails. Vitamin E not only keeps your nails moisturized but it also ensures your nails are hydrated. It also ensures that the nails and cuticles are nourished and strengthened. Extract oil from a vitamin E capsule by breaking it. To ensure proper circulation of blood and faster healing, massage the oil very well for about five minutes on your toe nails. In the case where brittle nails are caused by fungal infections, it is advisable that you use tea tree oil. Tea tree oil is a very strong antiseptic and this explains its excellence in fighting infections. Make a mixture tea tree oil and half teaspoon vitamin E.
Massage this oil on then apply your toe nails for a few minutes then leave it to work on the brittle nails for about 30 minutes. Using lukewarm water, rinse it off. Pat the nails dry then apply your preferable moisturizing lotion. This should be done two times a day for about a month. One of the most vital minerals that keeps your nails strong and healthy is silica. This herb contains silica and that explains why it is considered one of the top home remedies for brittle nails. Into a cup of hot water, add about 2 teaspoons of horsetail herb that has been dried. Lemon juice improves the state of the brittle nails by strengthening them and giving them a bright look. In the place of olive oil, you could also use Argan oil. Repeat this procedure three times a week. Tomato juice is a powerful antioxidant and this explains its ability to heal brittle nails by strengthening them and giving them a better texture. It has a natural and strong antiseptic. This is a powerful weapon that is useful in the treatment for fungal infection. For the remedy to work, you should eat the garlic as well as apply the garlic preparation to the affected area. Being a rich antioxidant and being made up of many nutrients, almond oil gets your nails nourished as well as preventing them from breaking. Among the many home remedies is watching what you eat. This is very crucial since one of the reasons you have brittle nails is that your body does not have sufficient nutrients. For you to treat the toenails, it depends on the severity and extent of the infection. There are several topical medications that are effective for your toes. There are drugs that you can also take through your mouth. The antifungal Lamisil or sporanox is an available antifungal infection that you can take orally. There are chances when your doctor might make a decision to give both a topical and oral solution. This is still effective for treatment of fungal infection which then lead to brittle toenails. Prevent your nails that are already brittle from deteriorating and becoming worse. This arises especially as a result of friction and tearing off. It also improves the health of your nails. It protects them from any excess moisture. Calcium. This is a mineral that is meant to make you’re the nails of your toes to become stronger every day. Thy thus prevent them from becoming brittle. Iron supplement. There are other cases where brittle nails are a sign of anemia. In that regard, the use of iron supplementation replenishes the blood situation. The condition is thus bound to improve. Cysteine supplement. This is an amino acid supplement that works on the keratin. This is the protein that is responsible for the growth of nails. It is therefore able to make your toenails more stable and stand brittleness. Silicon. This works to reduce any roughness that may be on your skin. Further, it reduces the any modifications that may be present on your skin. Horsetail herb. It has high amounts of silica. The silica has the same effects on your toes just like silicon. This remedy has been used for a long time in the diabetic patients.